Season the sword fish fillet with fine sea salt and white pepper in both sides. Brush a Silpat® with olive oil. Position the seasoned sword fish steak on it. 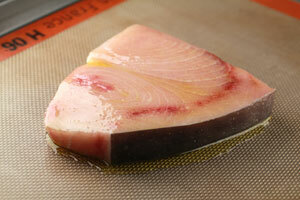 Brush the fish surface with more olive oil to impart a nice flavor to the fish. Bake for about 7-8 minutes at 500 F. Rotate in oven. 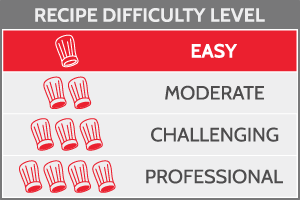 Check if it is cooked with the help of a thin metal skewer. It should be warm. If it is hot, the fish is overcooked, this should be avoided! Serve the sword fish in a white plate with half lemon on the side. Check carefully for darkness or dryness on the skin and flesh of fish. 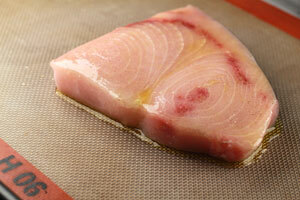 Off odors or smells in the piece of fish should be avoided. Fish should be vibrant and smell fresh. Farm raised or wild is ideal.